OurEnergyPolicy.org | A Regional Approach to Offshore Wind? According to The Department of Energy (DOE), the United States has 4,000 GW of offshore wind energy potential, with the strongest winds located off the North Eastern Atlantic Outer Continental Shelf (OCS). There are currently no operational offshore wind farms in the country, but the Bureau of Ocean Energy Management (BOEM) has identified 18 states which are involved in early stage offshore wind projects. High profile offshore projects like Cape Wind have faced stiff opposition over the last decade and the first project to begin construction, Block Island, has only recently done so. Utilities and regulators have raised concerns about electricity prices and difficulties in securing financing for these projects. Public opposition has voiced concerns about scenic and environmental impacts, as well as shared ocean use for fisheries and recreation. The resulting legal battles have injected a large amount of uncertainty into the industry’s future and highlighted what some see as shortcomings in state policy addressing offshore wind. A recent report co-authored by Navigant Consulting and the Clean Energy Group concludes that “current offshore wind policy isn’t working.” The report recommends that states should coordinate policies to streamline regulatory, financing, procurement, and permitting in order to increase market access for offshore wind projects, sharing costs and benefits regionally. The authors suggest that by doing so, they could lower project costs and risk while increasing regional energy reliability, diversity, and help with meeting federal environmental regulations. Are multi-state efforts likely to be more effective in deploying offshore wind projects? Is it sound policy to provide incentives for offshore wind projects? 9 Responses to A Regional Approach to Offshore Wind? Offshore wind should show higher capacity factors than those for in-land wind applications, which hover at an average of ~0.25. Hence, they should produce more energy for the same installed capacity than an inland farm in any given year. Offshore wind installations tend to be, for obvious reasons, more expensive to build and maintain. Can multi-state efforts enhance the prospects of offshore-wind? Policy support by a number of coastal states could be instrumental to enhance the prospects of offshore wind. Yet, there is no amount of policy support that can override the objections of property owners, tourism-oriented business, etc. Given the coastal property prices, those sectors tend to exert a disproportionate influence (in terms of numbers) on the sources of political power. So, the problem seems to be, more than a policy one, a problem of generating a national (or at least coastal states) consensus of the need to avoid forms of power production that are bound to make life in this planet harder to coastal inhabitants. The bet for anyone close to the shore is that, if other forms of power do raise the ocean levels or pollute them, then he or she will experience unpleasant health and financial consequences. It is happening frequently now: NY, Louisiana, FL for instance. How likely is that the unpleasant consequences will NOT materialize? The science indicates that unpleasant consequences are indeed likely (or more than that). Hence, a concerted educational effort towards helping stakeholders understand the urgency of changing direction in power generation could probably be one of the best subsidies to help offshore wind. Regarding incentives for off-shore wind, the reasons noted above make it necessary to find ways to help start installations. Given the state of federal finances, it would appear apparent that states should urgently agree on subsidies, cooperation and grid interfacing and stability issues at the multi-sate level. The report referred to has several angles that it is arguing. One, that America will lose out to Europe if we don’t get moving, I believe is somewhat misplaced. In my opinion, the European adventure in off shore wind cannot be considered particularly successful. It is expensive and European countries have offered generous feed in tariffs. The willingness to pay 20 cents per KW is hard to find in the US. Connecticut, Rhode Island and Massachusetts have highest rates in the continental US, but not that high. Trying to streamline the front end of the process may help, but it is more important to get an integrated technology for off shore wind that will be competitive rather than just copying what Europe is doing. Providing incentives for innovation is important rather that providing subsidies to existing concepts. Several questionable assumptions are revealed in the report. 1) It is assumed that as wind gets geared up and units get larger, the price will come down “just like solar”. Solar panels did not get bigger; they remained the same size. We just made a lot more of them in a factory setting. It is doubtful that making bigger turbines and assembling them at sea will significantly bring down prices. If we want to “be just like solar”, we need to make small, light weight units assembled on shore that can be mounted quickly at sea with relatively little equipment. 2) It is assumed that balancing the intermittency of wind must be accomplished by building transmission lines to average out large areas. Focusing on storage might be more effective. Off shore wind, especially when a floating platform is called for, has some built-in potential for energy storage through compressed air. Hydrogen, integrated with the transportation system is another approach. A camel is a horse designed by a committee. A call for assembling governmental groups in general will only smooth out existing problems without directing themselves to existing fundamental weaknesses in the concept of off shore wind as it is now deployed. Trying to adapt land based wind technology to off shore has not re-evaluated the differences between land and sea. Integrated innovation is the first order of business. I have little faith that well meaning bureaucracy can accomplish this. Mr. Perez-Blanco made a good point; an educational effort would be helpful. Maybe a push to sell little off shore wind power models at beach gift shops rather than lighthouses would work. It is always interesting what people find comforting and attractive. Government can and should take steps to make permitting an off shore wind farm a straightforward process. However, rather than subsidizing a particular clean solution, it would be better to put a rising fee on CO2 and let the market figure out how best to supply clean energy. In the case of offshore wind, a successful solution may be the Makani “kite” system where a wing strung with propellers tied to generators is held by a tether and turns in a circle gathering energy. The wings can fly higher than normal wind turbines and therefore can provide more consistent energy. The ocean based platform is also much smaller and less costly than traditional at-sea wind turbines. The Makani system, backed by Google, is still in development but it shows progress. Brandon says “Providing incentives for innovation is important rather that providing subsidies to existing concepts.” That’s quite right. As Prof. Perez-Blanco points out, there are multiple factors that make offshore wind unattractive and unfeasible. There is nothing inherently wrong with multi-state cooperation, but that does not alter the fundamental economic and technical disadvantages of off-shore wind power. As for the decline in the cost of solar — meaning photovoltaic — power, Brandon is right that large size clearly had nothing to do with it. Actually, much of the price reduction resulted from Chinese ‘dumping’ of surplus production at prices below cost. Tariffs imposed to correct that abuse are expected raise PV prices by about 14 percent. If offshore wind were competitive with existing power technologies, there would be no need to subsidize it. If it’s not, which is the case, there is little reason to subsidize it anyway nor much public motivation to do so. Coal-fired power plants are steadily being replaced by ones fueled by much cleaner natural gas — a resource that the US has in abundance. Nuclear power provides a substantial amount of low-carbon, reliable electricity. New, cleaner and safer nuclear technologies could expand that capacity if existing regulatory hurdles were reformed. Lewis: Solar panel prices have dropped 99%, from $76/watt in 1976 to $0.74/watt in 2013. Chinese dumping is not the main reason for this trend and, as you point out, tariffs are in place to correct for the impacts of dumping. Solar is a cost-effective way to generate energy. As for a carbon tax, if the taxes collected are 100% distributed back to the public then the public will support a significant carbon tax. While a carbon tax doesn’t seem politically possible now, like gay marriage, we are going to go from impossible to inevitable without ever stopping at probable. It’s going to happen. While coal and natural gas are priced low, they have external costs that are quite high and those costs must be paid by the rest of society. So society is already subsidizing fossil fuels. It makes sense to have these dirty fuels pay a pollution fee or, alternatively, to subsidize clean fuels that don’t burden society. When it comes to shifting away from fossil fuels and lowering global emissions, time is of the essence. Europe provided the reduced financial risk investors needed because they believed building the wind farms is a societal requirement that will protect the water and air from fossil pollution and reduce the future devastation of climate change. Their comprehensive government incentives combined with firm renewable targets have been crucial to the extensive European offshore wind development. Here in the US, an Atlantic City wind project, shovel ready for 3-4 years, remains up in the air because the state’s utilities have balked at providing funding if federal funding should disappear, or the price escalates. Back in 2010, Secretary of the Interior Ken Salazar launched a ‘Smart from the Start’ wind energy initiative for the Atlantic Outer Continental Shelf. The Department of the Interior identified areas with the highest wind potential and fewest conflicts with competing uses. Environmental review was also undertaken to assure the areas would have no negative impact on the coastal environment. Lease actions were held, leases sold. Those positive actions were not enough. In Virginia, Dominion Power outbid another company, purchased the leases but has yet to include building offshore wind in their 10-year capital spending projections. The Virginia leases are evidently on ‘layaway’. The price of offshore wind won’t come down until the industry gets established and investors see the benefit …. until that factory sees enough security ahead to get built. There is also a transmission and grid connection project waiting to be built – The Atlantic Wind Connection. Is a proposed buried transmission cable that will connect wind farms on the Bight from NY to Virginia, bringing the energy ashore at a few specified places. This ’spine’ eases all the issues of connecting to the PJM grid and reduces intermittency by connecting the wind farms up and down the coast. The Atlantic Bight, our “Saudi Arabia” of wind on the wide, windy and shallow edge of the continental shelf 10-20 miles from shore, could produce enough electricity to meet 1/3rd of the whole country’s energy requirements. The Mid-Atlantic section of the Bight, running from Cape Cod to Cape Hatteras, could produce 330GWs of electricity, more than twice the amount the region now uses. Supporting the development of this resource means supporting the investment required to build the industry, its work force and its supply lines. That is surely in the country’s best interest – lots of electricity without the nasty constraints created by finding and digging up nuclear or fossil fuels. While the potential for offshore wind is great, so is the cost and this has proven to be the biggest deterrent. I believe that if the cost of offshore wind was competitive with other renewable technologies, we would see rapid deployment. So why is it so expensive? The DOE estimates that 60% of offshore wind resources are located in deep water where conventional foundations are not practical. 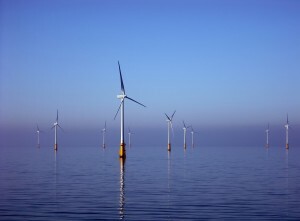 In addition, offshore wind turbines must be built for conditions that would lead to corrosion – i.e. saltwater. Then you have the transportation and construction costs to move equipment and personnel to run transmission lines and build out the offshore wind sites. All in all, there is a lot of extra engineering that needs to happen for an offshore wind project compared to a land-based project. So next we have to ask is the higher capacity factor (and thus turbine output) worth that extra cost? In other words, on a per MWh produced basis, how would the cost stack up against onshore wind or utility-scale solar? In Europe, electricity costs are higher (generally) so these projects can compete. Utilities in the U.S. can not justify investing in such projects domestically because there is no mechanism for recouping costs through a rate case. While in concept offshore wind sounds like a terrific idea, it just can’t compete on cost in the U.S. So that gets us to the question – should there be a policy specifically aimed to encourage offshore wind development? I have never been in favor of government picking technology winners and losers because it has a fabulously bad track record at that. I think the advancements have to come in offshore turbine design, manufacturing and construction. I think offshore wind will play a role in the future, but that it is still a long way out. When a single 1.5-megawatts wind turbine is converted, the gearbox is removed and so is the brake mechanism. The propeller blades are redesigned to operate at wind speeds in excess of 60 mph, which is four times faster than the average horizontal axis wind turbine is designed for. Because the integrated system is able to deliver on demand during peak hours and during the night time when the wind is NOT blowing, this system would qualify for long-term power production contracts on a par with coal and gas-fired systems. The installed cost is reduced by more than 60%, and the maintenance costs are reduced by as much as 90%. An adaptation of the (deleted) tied to 10 such turbines will provide 5 megawatts of continuous output power when the wind is not blowing and during the night time. The entire system will deliver up to 15 megawatts in optimum wind conditions. The installed cost for such a system is estimated at about $1,100 per kilowatt of installed capacity. When no offset reserve has to be created to support the five-year replacement cost of the gearbox and brake system, the numbers related to power output vs. cost input become extremely attractive. Perhaps more importantly, the real efficiency of the system is much higher than a conventional system because it becomes in effect a highly efficient heat exchange engine rather than simply a wind energy conversion unit. Wind turbines with thin blades use only about 5% of the wind’s potential. The Maximum Velocity (MV) turbine uses 100% of the wind – producing more electricity. All the air flow impacts the back plate causing it to accelerate and divert through the turbine blades. These blades are mounted around the perimeter at both the maximum point of leverage and highest flow velocity. All the air flow is then utilized for maximum energy conversion. Conventional wind turbines typically cut-in at around 8 mph. MV turbines can operate in wind speeds of around 1 kph even when under load. Conventional turbines kill birds by blade impact. Birds see an MV turbine as a solid object and therefore fly around it, not attempt to fly through it. The MV turbine can also be used as a water turbine in rivers. Coating the induction coils of generators with a proprietary material increases their output by one-third using the same amount of fuel. It has been demonstrated in a lab that when the induction coil of a common automobile alternator is coated with (deleted) impregnated in an epoxy resin the amount of watts output at the generator is increased by 35%-38%. The practical implications of this finding are profound – it means, for example, that if all generators used to produce power were (deleted) impregnated using this simple application, the amount of fuel required to generate electrical power to the grid could be reduced by 1/3. One application is to increase the output of wind turbine generators by about a third. Perhaps, in the longer term, offshore wind power might play a different role than generating electricity. This energy source might be used to convert the carbon dioxide in the upper level of the ocean where it is most concentrated to methanol or some synthetic fuel replacement for gasoline. One of the conclusions from the study ” California’s Energy Future” was that, in spite of conservation, renewable energy, and the use of nuclear power, this study was unable to demonstrate that its GHG goal could be met. This was because there was no carbon-free or a net zero carbon source of high energy density liquid fuels which is essential for air travel and other uses. However, with both water and carbon dioxide at the oceans’ surfaces a net zero carbon liquid fuel ( methanol) could be made by electrolysis and perhaps by other technologies. The first step in this process would deplete carbon dioxide from the ocean and when the methanol or synthetic fuel is burned in an airplane or some other vehicle, there would be a release of carbon dioxide into the atmosphere. The prevailing winds would carry this carbon dioxide back over the oceans where it would be reabsorbed, thereby creating a net zero GHG condition. In such an arrangement there would not be any expensive underwater cables to the land and the intermittent production of methanol, stored on site until picked up, would be unimportant. Producing methanol this way would be expensive, but curtailing air travel because of GHG concerns could be even more expensive.